With the iOS4 update, the iPhone can now have the long needed folders to help us better organize our endless list of Apps. It even goes as far as automatically suggesting a folder name based on the Apps you place together, but most of the time you'll want to edit the folder name. The real problem is when you can't find suitable name for the folder. 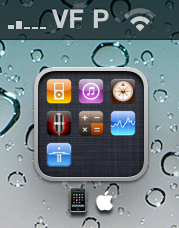 Even I had to resort to a folder named "junk" to put all the un-deletable Apple Apps I seldom use. Thanks to the Emoji and Glyphs, you don't need to use letters to name your folders. If you've been following my blog for a while you'll recall my post teaching you how to activate emoji on the iPhone. As for the Glyphs, it also quite easy: just use the free WebApp Glyphboard. With it you can simple copy-paste any of those symbols to wherever you like, and create artistic looking and puzzling names.